Transparency Market Research (TMR) has published a new report titled, “Bladder Scanners Market - Global Industry Analysis, Size, Share, Growth, Trends, and Forecast, 2018–2026”. 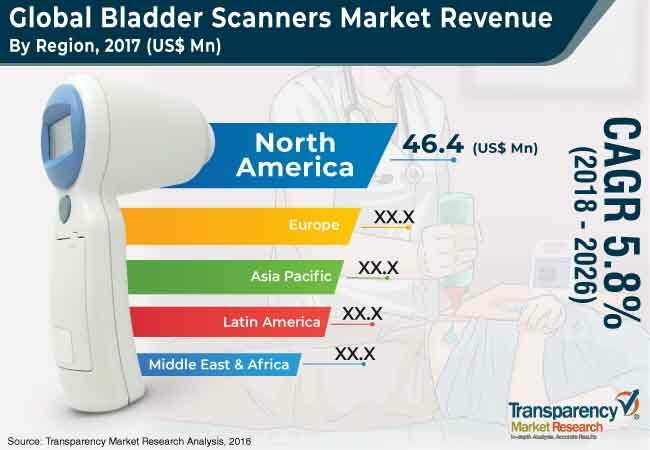 According to the report, the global bladder scanners market was valued at US$ 126.0 Mn in 2017 and is projected to expand at a CAGR of 5.8% from 2018 to 2026. The global market is growing at a rapid pace due to rise in awareness and acceptance of bladder scanners in proven applications and increase in incidence rate of urinary incontinence and lower urinary tract symptoms (LUTS) among patients. The global bladder scanners market has been segmented based on product, application, and end-user. In terms of product, the market has been categorized into bench top bladder scanners, portable bladder scanners, and handheld bladder scanners. Based on application, the global bladder scanners market has been classified into urology, obstetrics-gynecology, rehabilitation, surgery, and others. In terms of end-user, the market has been divided into hospitals & clinics, diagnostic centers, ambulatory surgical centers, and others. Rapid change in technology and frequent product innovations induce companies to develop novel products which in turn increases their market share and expands geographic presence. This is projected to drive the global bladder scanners market in the near future. Development and commercialization of non-invasive scanning equipment is likely to contribute to the growth of the global bladder scanners market. In January 2015, Australia-based medical device company Signostics Ltd. obtained the U.S. FDA 510(k) clearance for its hand-held ultrasound bladder scanner SignosRT Bladder. The device operates on ultrasound technology. The company expects that this device can be used to control catheter-associated urinary tract infections (CAUTIs) in health care facilities. The geriatric population suffers from a range of urinary disorders that are multifactorial in origin, especially urinary incontinence and urinary retention disorders. Hence, in order to cater to the demand for comprehensive assessment of lower urinary tract symptoms and concurrent medical diseases, functional impairment bladder scanners act as vital tools for investigation. Increase in the geriatric population is a major driver of the global bladder scanners market. Elderly individuals increase the patient pool in major regions of the world. According to World Health Organization (WHO) estimates, the global geriatric population will reach around 2 billion (22% of the global population) by 2050, which was around 962 million in 2017. The global geriatric population is projected to increase at the fastest rate in developed countries such as the U.S., the U.K., and Japan. Brazil, China, Thailand, and South Korea are expected to have a large geriatric population in the shortest span of time in the near future. This increase in the geriatric population is anticipated to boost the growth of the market, as this population is more prone to various age-related as well as chronic diseases. The need of bladder scanners among such patients is relatively higher, which leads to higher demand for advanced bladder scanners globally. The report offers detailed segmentation of the global bladder scanners market based on product, application, and end-user. In terms of product, the portable bladder scanners segment dominated the global market in 2017. Portable bladder scanners reduce hospital costs by decreasing the number of catheterizations, UTIs, and nursing time involved. These factors are projected to drive the portable bladder scanners segment during the forecast period. The handheld bladder scanners segment is expected to expand at a high CAGR from 2018 to 2026 due to ease of handling and circumferential measurement capability for more accurate results. North America was the leading market for bladder scanners in 2017. High share of the region in terms of revenue is because key players such as Verathon, Inc., dBMEDx, Inc., Vitacon, and LABORIE are domiciled in the region. Additionally, North America offers significant opportunities in the reselling and refurbished bladder scanner devices, as developing countries are eager buyers of good quality bladder scanner devices that are priced economically. These factors are projected to contribute to the growth of the bladder scanners market in the region. Moreover, introduction of technologically advanced bladder scanner devices and application areas in the region are anticipated to drive the market. Asia Pacific includes countries such as China and Japan, the Indian subcontinent, Korea (North and South), Southeast Asia (SEA), Australia, and New Zealand. The region was the third largest market for bladder scanners in 2017. Asia Pacific is expected to be the most promising market for bladder scanners due to increase in popularity of these devices in the region. China is likely to be the largest market for bladder scanners during the forecast period. The region is a potential market for refurbished bladder scanners. It consists of developing countries which require low priced diagnostic technologies to offer citizens basic medical facilities. The economy is expanding significantly in this region; however, it still has to adapt to the digitization of bladder scanner technologies. The report also provides profiles of leading players operating in the global bladder scanners market. These include C. R. Bard, Inc., Verathon, Inc., dBMEDx, Inc., Vitacon, LABORIE, MCube Technology Co., Ltd., Caresono Technology Co., Ltd., MEDA Co., Ltd., Mianyang Meike Electronic Equipment Co., Ltd., and Signostics Ltd. C. R. Bard, Inc., Verathon, Inc., and Vitacon are expected to dominate the global market for bladder scanners market. However, customers of bladder scanners have other options in the market.